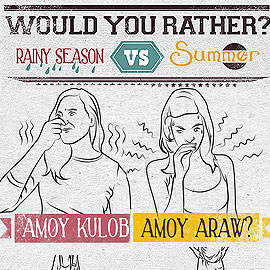 Would You Rather: Rainy Season or Summer? Which do you really prefer? (SPOT.ph) When the skies go gray, the gamu-gamo pester your lamplights, the traffic starts piling up, and teens stop regramming beach photos, you know it’s officially the start of the rainy season. So before summer recedes into a dim, sticky memory, let’s have a SPOT.ph-style smackdown between the two seasons. Summer gets much love, for obvious reasons, but is commuting to work in 39-degree heat really that much better than sloshing through the streets in typhoon weather? Or would you really rather feel rain on your cheek instead of sweat? Our infographic sums it all up below!